The addition of hopper mounted solid and pneumatic wheel assemblies changes your AeroSpreader™ Feed Broadcaster from a stationary to a highly mobile and versatile feed broadcast unit. 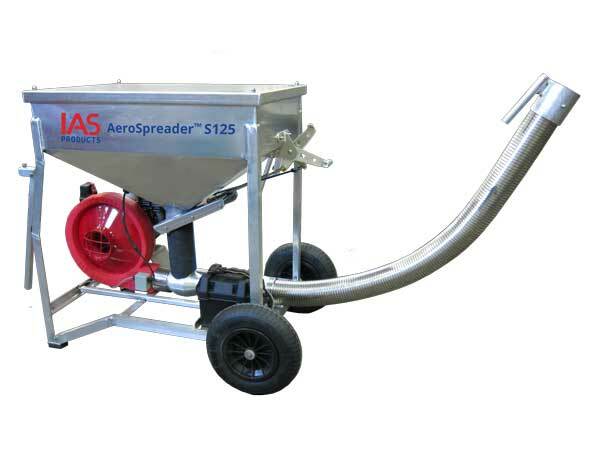 IAS Products can provide this option on our AeroSpreader Models S125, S250, S500 and S1000. For maximum stability over uneven terrain, each model is assembled in a 3-wheel configuration with the single rear wheel fitted with T-bar handle with a wheel friction pad as a simple and reliable brake. The rear center pivot wheel and handle assembly offers good control and high maneuverability. In this configuration the feeder can be easily turned pivoting effortlessly around either one of the front fixed position wheels. An alternative to the Aerospreader™ Mobile option is the Trailer option. Pneumatic tires ensure easy rolling over walkway or road obstructions. Rear pivot wheel allows feeder to pivot on left or right wheel for tight 180-degree turns. Feeder frame mounted wheel assemblies add little weight and maximize maneuverability making large load feeders easy to move. Ensure best feed pellet placement and spread in pens and raceways by maneuvering your AeroSpreader™ to take advantage of wind and current conditions. Maximum feed spread insures less competition and maximized feed conversion rates (FCR).